The tickets for the Disney World theme parks are one of, if not the most expensive portions of your vacation. Disney World does not offer much in the way of discounts on theme park tickets. The current system is called Magic Your Way. For days 1 through 3 you average over $70/day. 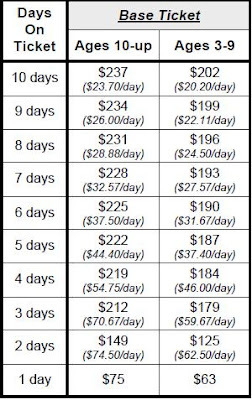 Starting with day 4 the average cost per day goes down dramatically. You are much better off planning one 6 - 7 day trip instead of two 2-3 day trips. The park hopping option costs $50 per ticket, no matter how many days you buy the ticket for. This really only makes sense for the longer visits. Otherwise save your money and don't get this option. You can always upgrade your tickets at the parks, even after you have used them, as long as you upgrade within 14 days of initial use. If you are unsure about Park Hopper option, don't get it and add later if you really need it. You can not downgrade tickets, or get refund for unused options. If not sure buy lower amount and upgrade when needed, no cost penalty to do so. When you are ready to purchase your tickets, stay with a reputable ticket seller. There is too much money at stake for minimal savings. There are a few other reputable dealers out there, but I have used these three and I trust them. Once you understand how the system works you can make intelligent decisions that will help you save money. 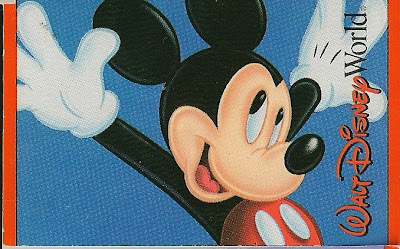 1 comments to "Disney World Ticket Tips To Help You Save Money"
Thanks a lot for sharing useful tips about money saving to Disney world ticket tips really help out with keeping the expenses down.